OK, it's happened. I'm now in full blown Halloween mode and I'm not sorry about it. 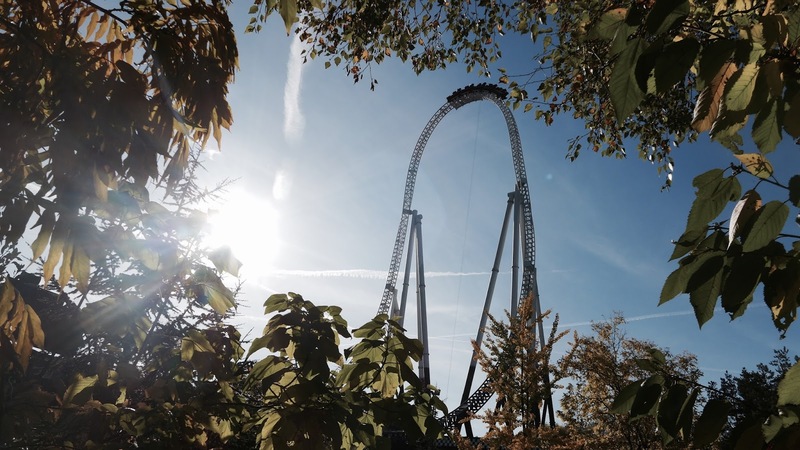 Theme parks during autumn and the Halloween season is my idea of heaven - the crunch of leaves under my boot, the sun low in the sky and coaster screams filling the air. Absolutely perfect! There are actually some parks, I'd argue, that are actually best experienced during this most magical of seasons where their true beauty and whimsy really shines through! Alton Towers is unique in its enchanting setting around the actual Towers and into the sprawling mystical gardens themselves. If you really want to make the most of the atmosphere at Alton Towers definitely try to visit for Scarefest in the autumn months. The entire woodland and garden surroundings look absolutely beautiful as the leaves change colour and start to turn and for some reason the autumnal crispness in the air as you whip around Nemesis really packs an extra punch! Walking through this park on an October day, clutching a hot tea as the sun goes down is one of life's little pleasures for me and honestly I could spend a whole day just wandering around soaking up the atmosphere. There's a beautiful melancholy gloom to the themes of the lands at the park during Autumn too - there's definitely something extra special about Gloomy Wood or Dark Forest that just isn't present when it's hot and sunny. If you're a fan of the autumn season then you'd forgive me for assuming you approve of pumpkins. 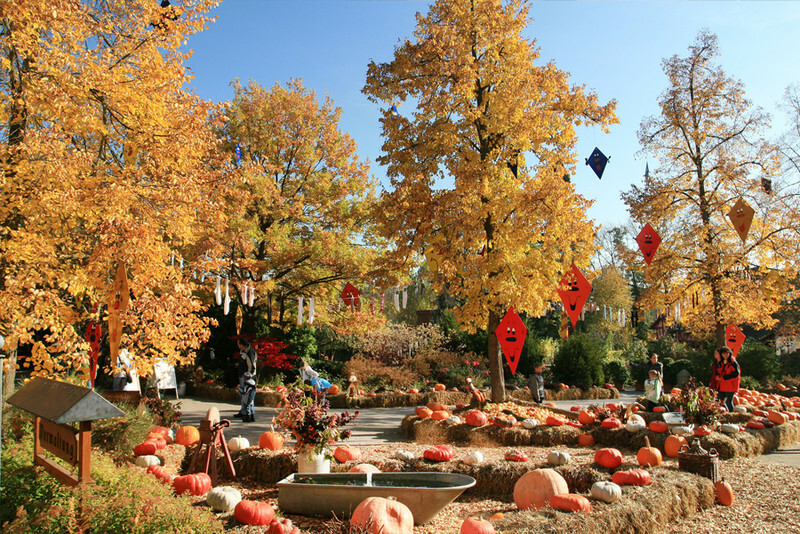 Turns out, Europa Park are pretty big fans of pumpkins too, which is why every October they cover the park with literally thousands of the things. Pumpkins everywhere as far as the eye can see! And what's fab is they don't just put them in places just because - they seem to really pay attention to where the pumpkins will compliment the area instead of being a burden, meaning they're just beautiful instead of being a nuisance (as I can imagine thousands of pumpkins potentially being). 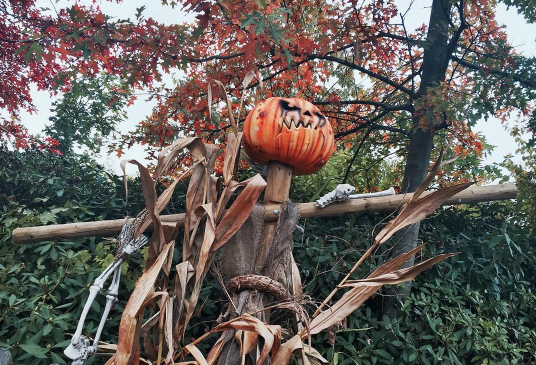 There are plenty of more rustic and traditional/fairytale style themed areas throughout Europa Park and the pumpkins add an accent of autumn to these area perfectly. Fairytale themed stuff + autumn touches is pretty much my recipe for bliss when it comes to theme parks, so I'd definitely consider Europa in October a happy place of mine. 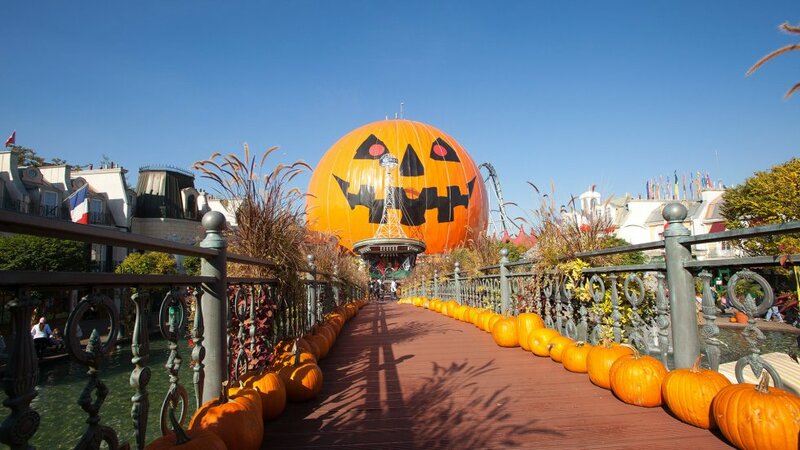 There's also a definite side of spookiness too - the entrance area is draped in cobwebs, spiders and skeletons and Eurosat is covered with an orange tarp to become a giant Jack'O'Lantern that somehow maintains its elegance when it could so easily tip over into tacky. I always try to write these things from experience but sadly I'm yet to experience the USA in all its fall glory. But when I do finally get over at this time of year I'll definitely need to book some extra luggage space for all the tat I'd definitely blow some cash on! 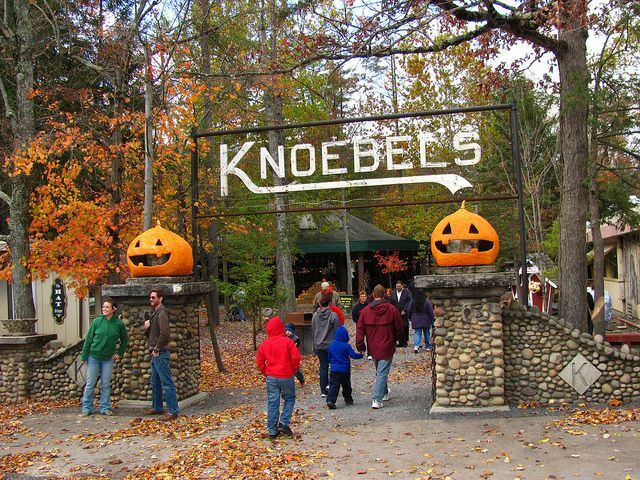 Seeing as the East Coast of the US is infamous for its beautiful fall season, makes sense that I'd go for a park from that area for this and I can't imagine any park to look more stunning than Knoebels. OK, I'm slightly biased as I've ONLY ever visited this park when it was decked out in its Halloweeny best, but oh my god. The low hanging autumn sun gave the entire place a stunning golden harvest glow that made even Mammut look appealing! The whole park is full of the cutesy rustic fairytale-ish building and settings that I absolutely adore and just look so beautiful when set against a backdrop of pumpkins and hay bales. Again, Tripsdrill is a park I would happily just spend an October afternoon wandering around. It's got this natural timeless countryside feel that provide the perfect backdrop for spooky pumpkin decoration! Oh, and they also have these fab giant gingerbread/Wicker Man looking things made of hay that are equal parts fab and terrifying! 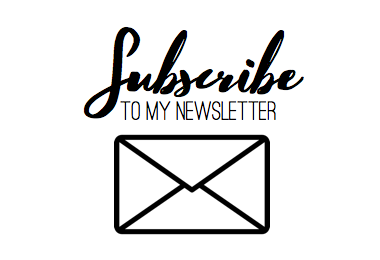 One of my biggest theme park regrets (ooh, blog post idea!) is not spending more time in Hellendoorn. On paper it looked like a smaller Chessington World of Adventures style park with some not very interesting +1s for me to nab on a quick cred run. 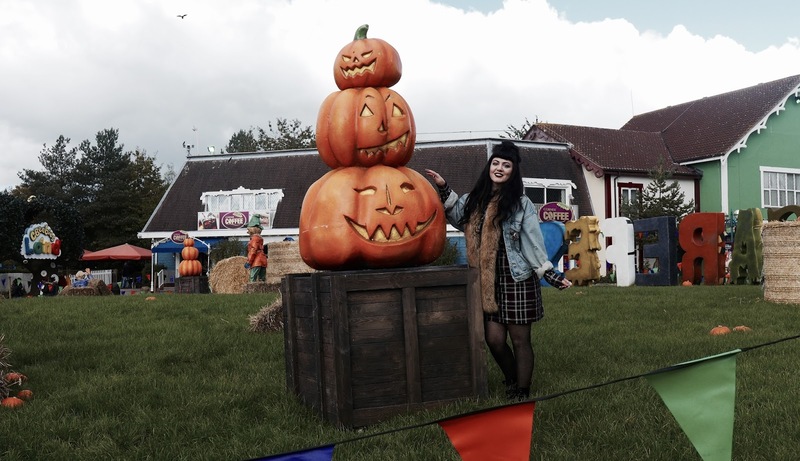 Annoyingly the whole place was wall-to-wall spooky pumpkin scarecrows, hay bales and spiderwebs so I basically cried the whole way round the park because I couldn't stay and soak up more of the fabulousness. It's definitely the setting that helps Hellendoorn here, it kind of feels like you've stumbled across a park in a forest clearing. The ground under your feet is earthy and wood-chipped . There was definitely more of a family spooky thing going on when we went - a spooky-not-terrifying scare attraction complete with witch characters hanging out outside and a cute old-school looking Haunted House attraction in one corner that definitely comes into its own when the park is done up to the nines for Halloween! That said, we got a flavour of the potential terror of the evening Halloween event in the queue for Rioolrat which was essentially a fog-filled tunnel with some sort of disgusting creature coming towards us out of the shadows. It really was foul and worked perfectly with the autumny feel of the park to add in a few extra scares in unexpected places! Let's face it, where I'm concerned every theme park is just...better in October. Just thinking of the crispness in the air and all the fab spooky events coming up puts butterflies (or..bats?) in my tummy and I can't wait for Halloween 2017 to begin!